Mixed Salad Annie: Strawberry Shortcake... Sort of. I've always liked strawberry shortcake. I remember when I was a kid we would have it all the time. My mom would buy those little round yellow sponge cakes and we would fill them with lots of strawberries and top them off with some Reddi Whip whipped cream. My mom would always prepare the strawberries ahead of time, by washing, cutting and sprinkling them with sugar and letting them sit overnight, to bring out their natural juices and create a delicious sauce. I didn't know it then, but this is known as macerating the fruit. It's kind of like marinating meat, only its with sugar, not an acid. This process really brings out the flavor in the strawberries and makes them softer and easier to digest. I can even remember the container that my mom would use to macerate the berries in. I think it was an old ham container. Funny, huh? I guess she liked it because it was made of metal and had a clear plastic lid and it was the perfect size for the amount of strawberries she had. My dad also loved this dessert. He would always have seconds, and following in his footsteps, so would I (and still do). Technically I didn't make the traditional strawberry shortcake, which uses, well shortcake. I made this on the fly, so I kind of cheated by using fat-free cool whip and made angel food cake cupcakes which takes a lot less time than a whole cake. But you could use whatever cake you wish. Even pound cake would be good. Place the strawberries in a bowl and add the sugar. Stir until well coated, cover and refrigerate for several hours or overnight. Top your cake of choice with strawberries and top with your choice of topping. I love strawberry shortcake! My mom makes it all of the time too. 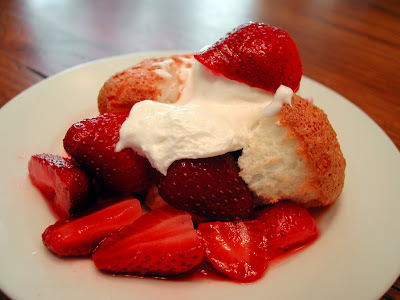 Any strawberry shortcake, even a "sort of," one is perfect. Now I wish I had a piece of my mom's.